After 12 league wins in succession, Berwick RFC have found themselves 10 points clear at the top of the Tennent’s East Region League 1. 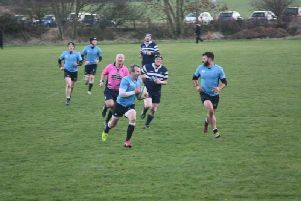 Saturday’s crushing 106-3 victory over Livingston (report page 46) emphasised the form that Owen Weatherhead’s side is on and, after Duns defeated second-place Royal High, Berwick now have real daylight at the top of the table. The title is the only realistic ambition for Berwick from here on in, but winning the league doesn’t necessarily mean promotion for the winners of the regional leagues. 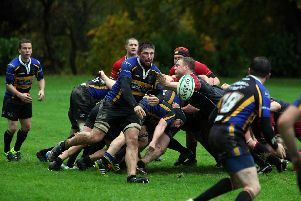 Last season, Hawick Harlequins won the East Region League 1 but decided against promotion because of the long trips in the National League 3 – which is not regionalised. Weatherhead, however, wants to challenge himself at a higher level but says the decision on promotion, should Berwick win the league, will come down to the players. “It will be a call the players will make – whether they can commit to going to Orkney, Gordonians and Newton Stewart. These are places that are whole days away. “The club will back them with whatever they decide. Once we know where we are, we will sit down and have that chat with them. “Winning the league and promotion is definitely our aim and what will be will be in terms of what league we are in. If Berwick do go on to win the league and opt to play in the National 3, all signs point to them being ready for the step up in level. Their form this season in the East 1 has been stunning, having won every league match since an opening-day draw with Royal High. Weatherhead puts that form down to the depth in the squad: “We have a lot of strength in depth in the backs. I watched the second team play and their backs could fill in for the first team. They are a good set of young boys that are keen to learn. The immediate future sees Berwick travel to Linlithgow as heavy favourites, as they look to stack another win to their pile. win on Saturday but we drew a line under it in the dressing room.